Autumn’s chill arrived in New York City this weekend, two weeks after the official start of the season. Following days of above average warmth, temperatures dropped dramatically overnight on Saturday when a cold front moved through the region. This arctic blast brought the city its coldest air of the season to date. Daytime highs plummeted from 78°F on Friday to 54°F on Sunday. 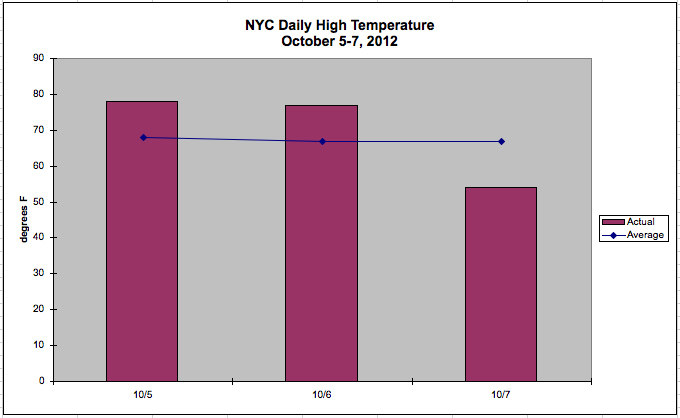 This jarring cold snap is a reminder that what goes up must come down, especially in a transitional season like autumn. Forecasters expect to see a rebound in temperatures later this week, but only to seasonal levels. This entry was posted in weather and tagged autumn, cold, nyc, seasons by Melissa Fleming. Bookmark the permalink.